It’s the last week of August and outside my window the trees are thrashing furiously in the strong wind, while down in the harbour the waves are crashing against the harbour wall with the blind persistence of rugby prop forwards. The sky is the colour of the kind of porridge you find congealed on sidewalks. Suddenly it feels like autumn. All the more reason, then, to bring a little colour back into the world with a flaming, bright red gansey. I finally finished it on Saturday. I seem, by the way, to have created my own “Zeno’s paradox” of ganseys: on the second cuff I managed to knit the first half (three inches) easily enough; but by then I’m starting to run out of steam, and the next inch and a half takes just as long; then the next three-quarters of an inch; and so on. But it’s over now. It’s very red – so bright in fact that I keep thinking I’ve left the light on; and several times I’ve gone out to admire the sunset, only to find it was the glow of the gansey reflected in the window. Once it’s been properly blocked and dried I’ll ship it down to my friend in Edinburgh; I’ve already warned him to be careful, or he’ll look like he’s been caught in an explosion in an Italian restaurant. Meanwhile it’s time to take a short break, and start planning the next project. It’s going to be another cardigan (c.f., Margaret’s Fife gansey in the gallery), knit in Frangipani cream, and will probably feature some of the intricate and riotous patterns from the far north of Scotland. It’s a scary thought that it will probably be the New Year before that one is finished, and the bleak (very bleak!) midwinter will hopefully be on the wane. Since moving up here I’ve come up with a new definition of summer: videlicet, any day when I don’t need a hot water bottle. So far this summer has consisted of about 19 days. By the way, I’ve just discovered I have an allergic reaction to something – but I don’t know what. Speculation is rife: what can it be? It’s not grass or tree pollen, or dust: could it be porridge? Vegetables? Reality TV shows? Proust? Work? So long as it’s not coffee or bread, I can probably cope; but (gulp) – what if it’s wool…? That is a truly stunning finished gansey and your friend will wear it with pride! The repetitive pattern is so lovely to look at but I imagine you’re looking forward to the more diverse pattern of the Hebrides, or combinations thereof. Will the new project be for yourself? Margaret? a friend? I received my new Frangipani in Soft Lemon last week and I’m really pleased with the color ‘in person’, sometimes monitors can be deceiving, but I won’t start this until winter. 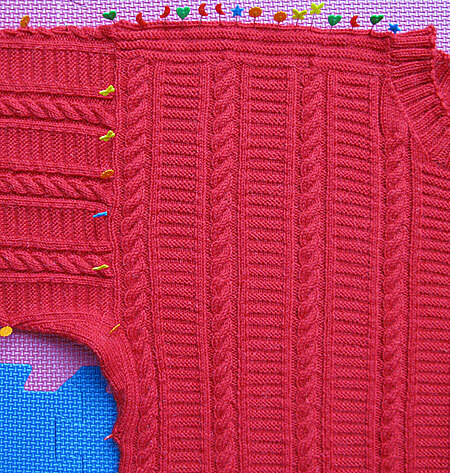 I’m still working on a cardigan with a “gansey-esk” pattern in it with lots of twisted knit and twisted purl stitches in it. It’s challenging, but will be rewarding – eventually. That is a lovely sweater. I can’t wait to see what the next one will look like. If you decide the wool is causing your hay fever, you can always switch to alpaca. I almost finished my little boy’s gansey, but then he tried it on and fingered the welts on the bottom and asked if I could fix it, like the seam had torn. Rather than explain/argue about design, I removed the welts and now I’m doing what I expected to do next year–working down in ribbing. Might as well add the extra length now. Congratulations to the new design of Scottish fire fighter`s sweater, it´s amazing. As to your ” allergy” : did you think on the new house? New paint or wall paper glue, etc. may also be reason of ” hay fever” . The finished gansey looks fantastic Gordon – even better than I imagined it would look. 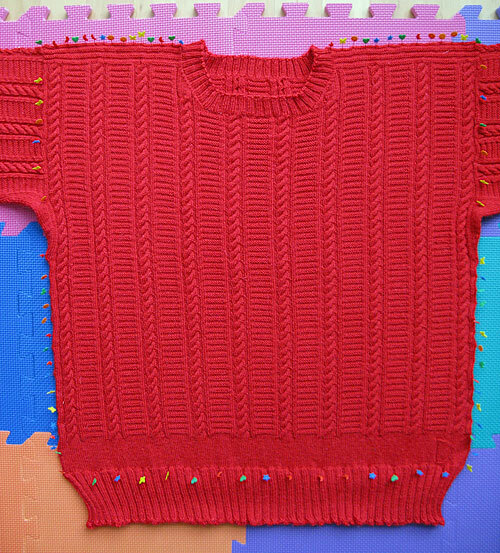 I’ve never knitted one with the pattern continuing right down the sleeve – all mine have just had a band towards the top of the sleeve but I’m tempted to go the whole hog for the next one! My repair work on a friend’s gansey is suffering from the same effect that you describe re finishing off the sleeve. And the nights drawing in make working in dark navy wool hard work on the eyes of an evening. I’ve promised myself a quiet Sunday afternoon this weekend in the hope that the weather will be sunny enough for me to sit in the window of my southfacing sitting room and make a concerted effort to get it finished. If it’s not too indelicate a question, might I ask what form the allergic reaction takes? That can often be a clue as to the cause. If your hands are fine then it’s unlikely to be a contact dermatitis due to developing an allergy to wool. And even if you have developed a rash on your hands it might still be due to other causes. I had a bad skin reaction when I started taking anti-inflammatory medication – I decided that the arthritis was less troubling than my reaction to the medication that was supposed to help control it! Finally Margaret persuaded me to go along and demand to be tested for allergies last month. Apparently most people produce anti-allergic wossnames at a level of 1-80; my level is 171. So I’m allergic to something, and we now know it’s not grass or tree pollen or dust. In the meantime I was prescribed a steroid nasal spray to see if that would reduce the inflammation (and get rid of the cold-like symptoms), and mirabile dicta, it works! I can breathe freely for the first time in 20 years. Which begs the question, why didn’t any of my doctors think of this themselves?! Welcome back! The gansey is beautiful. I think if I get around to knitting one it may be red. Visible in all weathers, cheerful for winter… the perfect color. Did they test you for fungus infections as well? Many sinus problems are due to fungus, which can have a ‘bloom’ whenever conditions suit it, all year long. According to the article I read somewhere, the fungus need not be one normally known to infest humans; some sinus cultures produced actual mushrooms. The new gansey will be for a good friend of Margaret’s, a small way of repaying many kindnesses and, of course, keeping me sane through another long Caithness winter (which is already starting…). Given my eyesight problems and the secondary cataracts I daren’t try knitting in navy, especially in the dark winter nights! (Maybe I’m allergic to cataracts?) I haven’t even looked at patterns yet, but the welt will be garter stitch-ish, not ribbed. That’s as far as the planning’s gone so far. I have a to-do list of ganseys (or pipeline, as consultants refer to future projects) consisting of 3 more ganseys for other people. After that I might switch to carpentry! Careful with the steroidal nasal spray. You don’t want to test positive for steroids and have the humiliation of losing all of your knitting titles. Dave’s response has me rolling on the floor. too funny. And as for the marsbars I almost had one when I was in Wales but something held me back(could have been the price) but I am glad because I am sure I would have become addicted right away and as far as I know you can only buy them in Europe so I would have been moving to Britain to fuel that addiction.hmmmm on the other hand Scotland here I come,with my gansey in tow of course.